Let your little ones explore the busy world of an airport with this realistic playset. With so many ramps for their cars they can raise the lift up to the tall control tower to help steer the plane. Huge airport playset with 5 die cast airport vehicles including a baggage carrier, fire truck, catering truck, mobile airplane stairs and helicopter. Large plastic four-engine cargo plane with front-loading cargo space for two vehicles. Numerous light-up and sound features controlled from the top of the airport tower. 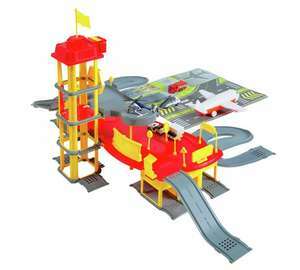 Multi level airport playset with fast track ramps and full functioning winch elevator to every level. Large central card play mat with a detailed airfield and runway design. Thanks for your comment.......Have you posted the deal for everyone to see? I’ve tried looking on the Argos site and can’t see anything similar that’s wooden?